Phillip Allen, Deepdrippings (International Version), 2017, oil on board, 183 x 183 cm, image courtesy the artist and Kerlin Gallery. Photography by Denis Mortell. ‘The eye lives in this texture as a man lives in his house’ wrote Merleau Ponty in his 1961 essay Eye and Mind, one of his final and perhaps most important papers. There is a rich tradition in the existential-phenomenological school of philosophy in the treatment of art as a similar mode of inquiry to that of the phenomenological reduction, by directing our attention to our experience of the world, or to the experience of a work of art, and applied in the present case, the encountering of ‘Deepdrippings’, an exhibition of new paintings by Phillip Allen currently on show in the Kerlin gallery. 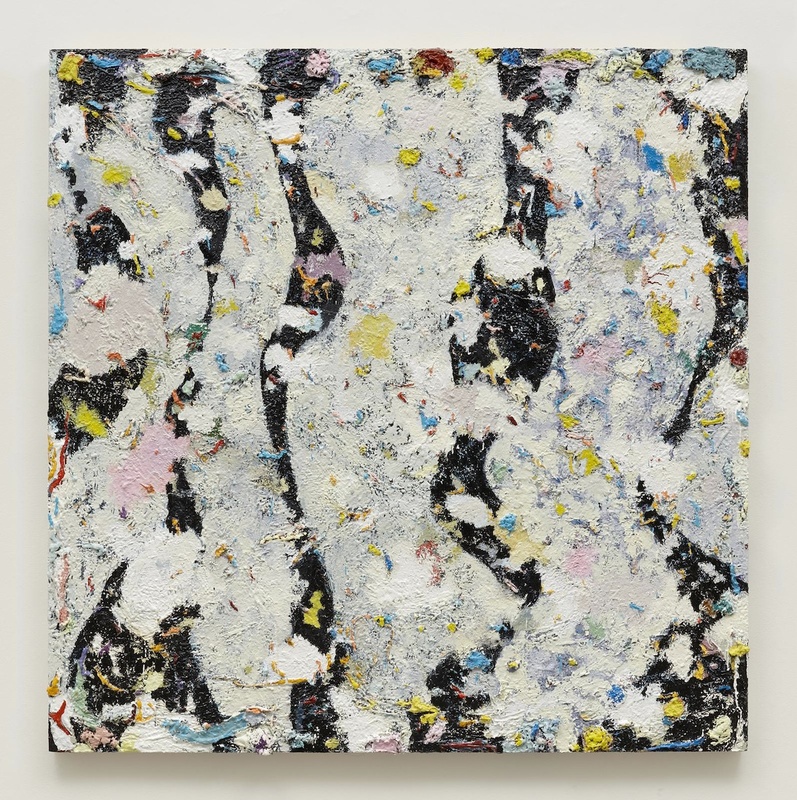 The deeply layered, heavily dense, almost stucco-like paint, feels like it’s fixed rather than applied to the surface, at once hovering and buzzing, floating and hard to pinpoint, it gradually and pleasantly pulls into focus upon closer inspection, where the real subtleties and indexical marks can be read as they dart and gleam across the mounded and thick topography of the canvas. There is an open invitation for the viewer to examine the surface, follow the cracks and crevices, the vibrant dashes and flicks of colour, then lose this detail as you step back from the frame, allowing the gestalt to consume your vision and push the whole thing into a distorted and fuzzy but simultaneously delightful and considered mess. The effect is both hypnotic and sustained, testament to the phenomenological depth of the larger paintings on show, where, momentarily at least, we can suspend or bracket our natural attitude and experience the sheer presence and totality of the painting. The exhibition as a whole is solid and coherent, both in palette and form, evidenced further in the titling of several pieces as ‘versions’, as if they are not specific entities in themselves, but rather slight mutations or spawned replicas of a former work. Although this is characteristic of Allen, in adding the supplement version to the title of his paintings, one can’t avoid the strong desire for more variance, particularly with the smaller canvases, in the actual composition of the painting and break away from the rather strict and direct containment of the heavily impastoed frame. This framing, however, does allow them to act like windows, extreme viewing portals, although unfamiliar and heavily condensed, like a magnified and fizzing petri dish, they satisfy the perceptual itch, seeming equally open to both spontaneous possibilities and more in-depth encounters. Ruaidhrí Kelly is an artist based in Dublin. Phillip Allen’s ‘Deepdrippings’ at the Kerlin Gallery runs until 25 March 2017.